For a re-design challenge at the He-Man.org fan-art forums. The thread is here, my post is here. The first round voting polls are here and here, and the final vote can be found here--I placed 4th out of the finalists. The subject this time around is Horde Prime, Hordak's brother and leader. Horde Prime's Throne Room (center): Centuries before the Horde invasion of Etheria, Horde Prime engaged the heroic champion Light Hope in a battle of apocalyptic proportions. The battle ended in a stalemate, both combatants having received near-fatal wounds. Light Hope sacrificed his wounded physical form to become caretaker of the Crystal Castle and protector of Etheria. His power was greatly increased but his new discorporate form was bound to the castle itself. Meanwhile, suffering under the effects of Light Hope's powerful magic attacks, Horde Prime found himself crippled and trapped in his giant form, unable to shapeshift back. He retreated to his flagship, the Velvet Glove, and there, with a combination of advanced Horde science and pirated Infinitan magic, his servants built a sarcophagus-like regeneration chamber. The chamber, combined with Horde Prime's shapeshifting abilities, allowed him to slowly form a new body, gestating within the colossal rotting husk of his old form. This embryonic body often manifested itself as a secondary head, sprouting from the eye socket of Horde Prime. Horde Prime's twisted body renewed itself in a twisted mockery of life and birth over the course of centuries, and in the meantime he plotted revenge against Light Hope and Etheria (it was during this time that Horde Prime's younger brother and trusted disciple Hordak became the de facto leader of the Horde). Horde Familiar (left): Through the use of his shapeshifting and magical abilities, Horde Prime can focus his life force to temporarily create a small demonic familiar to act as a spy or messenger. Horde Prime can see through the eyes of these creatures, and act through them. These extensions of Horde Prime were generally reserved for the gravest situations, such as delivering critical information to Hordak without risk of interception. Many rebels have made the fatal mistake of judging Horde Familiars by their relatively small size, failing to realize that a creature with even just a fraction of Horde Prime's cosmic power is still a formidable foe. 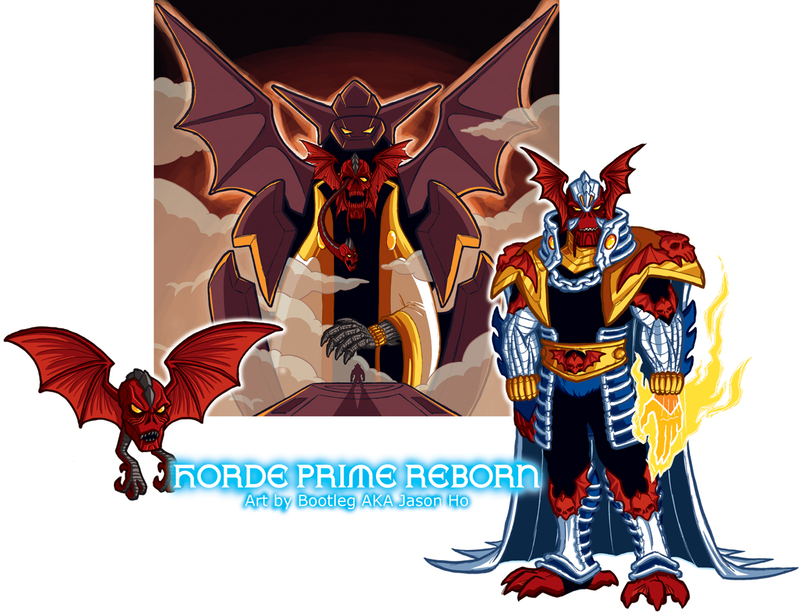 Horde Prime Reborn (right): With the revelation that the two most powerful beings on Eternia (He-Man and Skeletor) had disappeared from the planet, Horde Prime realized that it was the time to strike. Forcing an acceleration of his regeneration, through arcane lore and untested science, Horde Prime is reborn! The cruel leader of the Horde is still regaining his god-like levels of power, but even still he is perhaps the most feared being in the universe. While Hordak holds the Etherian front, Horde Prime leads the invasion of Eternia. Horde Prime seeks nothing less than the utter subjugation of He-Man's homeworld, after which he will return to Etheria to crush his old enemy Light Hope. If this were a toy, I would see Horde Prime's throne room as a playset, with his giant form being molded into the facade of the regeneration chamber, and his giant arm being a spring-loaded capture claw. Of course, the highly sought-after Horde Prime Reborn action figure would be packed in exclusively with the playset. C'mon, dude, that guy's got a head coming out of his eye! Gross! You've been using it a while, but I really like the non-black outline work you do. Is there a name for it? I can't even draw a damn stick figure, so I'd have no idea. mark: thank you for being one of my few regular readers who doesn't know me in RL, and for having the good faith to ask me a question in the comments, even though i'm a jerk and i take forever to answer comments usually. at the day-job, we call those colored lines "color holds," though to be honest, i have no idea if that's a standard industry term. Don't sweat it, man. I think I've posted more HERE than in my own damn blog recently, so we all have our own problems. "Color holds"? That'll work for me. It comes off great in this piece. post script: i haven't forgot about beast wars--its still on my long and cluttered list of intensely nerdy things to draw for this blog.